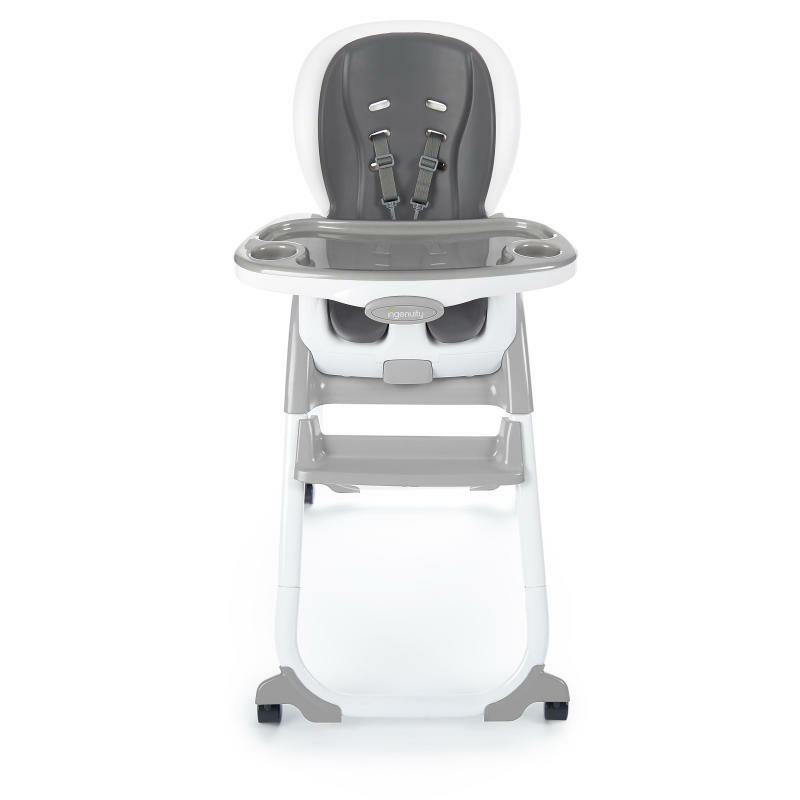 SmartClean Trio Elite 3-in-1 High Chair - Slate is rated 2.3 out of 5 by 3. As every parent knows, kids grow up fast. The SmartClean Trio Elite 3-in-1 High Chair™ easily adjusts from full-size high chair to booster seat to toddler chair to keep up with your growing baby. The chair wipes clean instantly and is dishwasher safe, so you can slow down the clock by spending less time on kitchen cleanup and more time with your family. The dishwasher-safe EasyClean™ tray also features four locking positions to grow with your baby. And as your family expands, it can too. When used as a booster and toddler chair, this intelligent design from Ingenuity can seat two children at the same time. Seatpad – Wipe clean with a soft, clean cloth and mild soap.Plastic Parts – Wipe clean with damp cloth and mild soap. Air dry. Do not immerse in water.Frame – Wipe the metal frame with soft, clean cloth and mild soap.Tray/Tray Insert – Dishwasher safe. Wipe clean with a soft, clean cloth and mild soap. Rated 1 out of 5 by katie123 from Not dishwasher safe as advertised This product is advertised as having a dishwasher safe seatpad and tray, but the seatpad becomes warped in the dishwasher. The manufacturer does not offer replacement parts. Very disappointed. Rated 1 out of 5 by Mold parents be aware from Disgusting Mold Please post this review. Rather than hiding the product deficiencies. Consumers have a preference for honest fellow feedback. I have already warned consumers with this review on several major retailers. Now, kids2 keeps sending us a form to fill out, almost every day from a different c/s rep. We complete it... Same this the next day. Completely disheartening. Buy wood instead. Design allows and cultivates disgusting mold in the base. If you own this or similar product hold the white base up to a bright light, or better yet take the screws out. All the spills and wipe down moisture gets in, but can not get out. No ventilation. This has nothing you can prevent. Really poor design. Rated 5 out of 5 by t from Best high chair! love how easy to clean this high chair is - mealtime is very messy at our house, and I love that I don't have to wash any cover, I can just wipe it down and go!